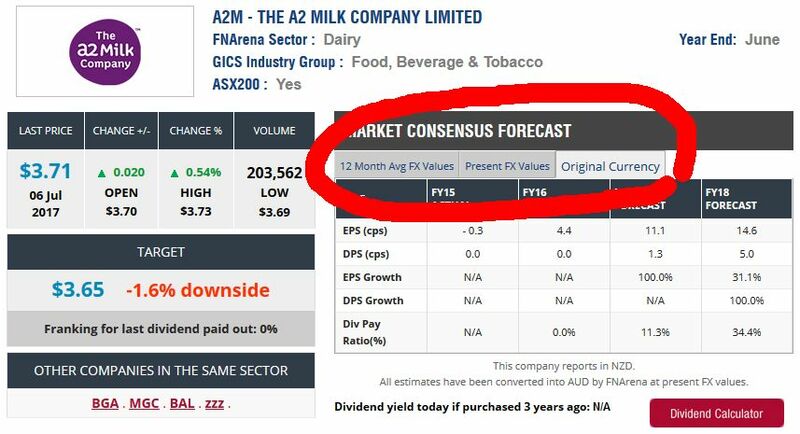 Most visitors would be well aware the FNArena website offers insights into profit and dividend estimates for circa 400 ASX-listed stocks. As a matter of fact, it's probably the key reason as to why many are regular users of various tools and overviews on the website. Not every company reports its financial numbers in Australian dollars. Multinationals such as CSL, BHP, ResMed and Woodside Petroleum use the US dollar as their prime reporting currency, others originate from New Zealand (a2 Milk, Fletcher Building, Xero) or report in British Pounds (CYBG). To offer quality insights and maximum flexibility, FNArena does not simply translate such foreign currency forecasts into Australian dollars. First and foremost we show what the original data and forecasts look like, so investors can assess the raw, underlying trend in operational performance, and then we offer two different options for Australian investors to investigate. One is the translation of foreign currency data into AUD through the average currency values over the past twelve months. The second one uses the FX cross value from the same day. The difference in FX input through options two and three may seem trivial, but there are times when different AUD values can make a noticeable impact. FNArena subscribers, we feel, have access to all the right tools to make optimal assessments and timely updates, without having to rely on arbitrary, static FX translations. In practical terms, this means Stock Analysis shows three different tables for companies reporting in foreign currencies, each with their own tab. There are no PE ratio and dividend yield calculations available in the original currency table (due to different FX for forecasts and share price), but such calculations can be found under each of the two following tabs. The differences in PEs and implied yields in the following two tabs are because of different AUD values over the past twelve months and where the currency trades right now. Investors still have to make their own judgment as to where they think the currency will be trading in the year(s) ahead, but at least they have two options to draw initial conclusions from.